Ben McAdoo doesn't think the Eagles will win the division this year. "How much success has Philly had? I think they're gonna have a hard time handling success." You can hear that as a snarky, petty, uninformed mis-analysis of the culture of the Eagles franchise. Or, you can hear it as an objective rumination about the pitfalls and challenges that face any successful NFL franchise. The first interpretation seems much more likely, but both interpretations have merit. Is it a criticism of the Eagles' character? Is it a predictor that the team will lose focus and desire as it basks in the luxury of championship life? McAdoo was an ascending tight ends coach on the 2010 Packers team that won the Super Bowl, but has not returned. He was the offensive coordinator for the Giants in 2014 and 2015 under Tom Coughlin, whose 2011 Giants won the Super Bowl and haven't won a playoff game since. "I think there's a point there. I mean, quite honestly, complacency can set in," he said. Pederson also told 6ABC that his team leaders and his players coming off injury would supply motivation and fend off complacency. Pederson has every reason to believe that. 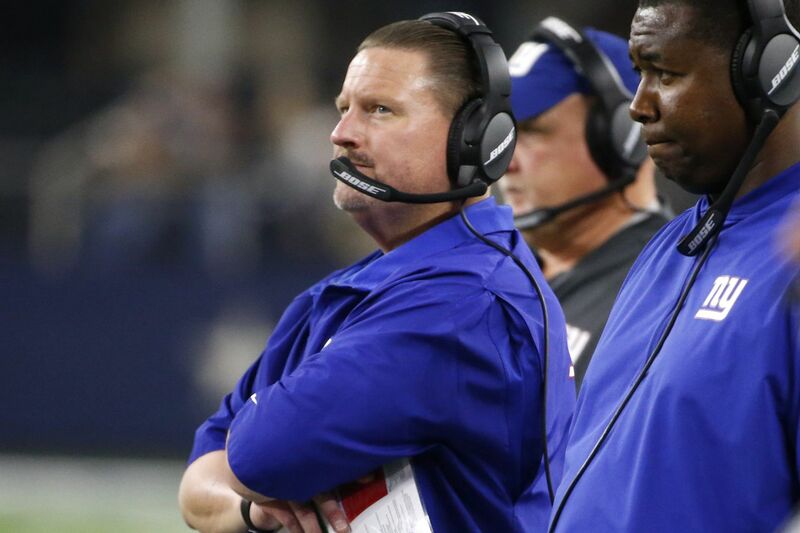 Still, considering the endless victory lap the franchise has taken since Feb. 4, McAdoo's criticism is both warranted and logical, if not particularly well-researched. After all, the club didn't exactly swathe itself in deferential glory when, at the end of the victory parade, the inebriated All-Pro center wearing in absurdist mummery blasted profane invective that trumpeted the team's numerous validations … then launched a motivational tour. Not long after that, the backup quarterback embarked on an autobiographic book tour that would have been unthinkable in the weeks before Nick Foles became Super Bowl MVP. It's hard to consider for a region still awash in joy after 51 years of Super Bowl irrelevance, imagine what Eagles fans would be saying if the Cowboys acted like this. McAdoo cannot know this, but Pederson's right. The team's coaching staff and captains are influential enough to keep complacency at bay. Also, plenty of significant players still carry chips on their shoulders, among them undrafted running back Corey Clement, local kid-made-good; Jason Kelce, the uber-Mummer; right tackle Lane Johnson, a Hall-of-Fame talent stained by two PED suspensions; and cornerback Jalen Mills, the Green-haired Goblin. On the other hand, you could choose to hear what McAdoo said as an honest observation that the Eagles, like every Super Bowl winner, saw their staff decimated and saw their roster diminished, with no guarantee that the main sources of personnel improvement – players coming off injury – will be effective. Foremost, the absence of the firm hand, selfless support and steadying influence of departed offensive coordinator Frank Reich, now the head coach at Indianapolis, cannot be overstated. It was Reich who believed that Carson Wentz could start immediately in the NFL the first time he saw Wentz on tape. It was Reich who formulated game plans for head coach Doug Pederson and the rest of the staff to winnow. It was Reich in Pederson's ear on every fourth-down play call – the Eagles went for it 18 percent of the time in 2017, 34 percent more than any other team – and that includes the Philly Special. It was Reich who incorporated six running backs in the No. 3 rushing attack in the NFL. And it was Reich who oversaw the development of Wentz, the assimilation of receivers Alshon Jeffery and Torrey Smith and the resurrection of Kelce and wide receiver Nelson Agholor. Reich worked with John DeFilippo, the only quarterbacks coach Wentz has known, who now is the offensive coordinator in Minnesota. Nate Sudfeld blossomed under "Flip," and he shepherded Foles through an elbow injury. How this edition of the Eagles rebounds from injuries will be essential. We have no idea how Jason Peters' 36-year-old knee will endure during his 15th season; or how Darren Sproles' 35-year-old knee will endure in his 14th; or if middle linebacker Jordan Hicks, the nerve center of the defense, will be dependable after suffering a fourth major injury in six years (not counting a broken hand last offseason). Wentz is young, but he tore his knee up in December; can he be back in nine months? Personnel departures aren't back-breaking, but LeGarrette Blount became the leader of the running back corps after Sproles' injury, Smith was a deep threat on the field and a strong voice in the locker room and tight end Trey Burton was a multi-faceted threat — including, as we witnessed, a Special touch around the goal line. McAdoo might not have meant it this way, but reloading the roster and the coaching staff of a Super Bowl team is as much a part of dealing with success as staying humble and staying focused. Neither should be a problem. Considering the democratic process by which they are run, the strong personalities in the locker room, and the overall depth of the roster, these Eagles remind you more of the 2013 Seahawks than those 2010 Packers or the 2011 Giants. That Seahawks franchise returned to the next Super Bowl and remained very good for the next three seasons. The same should be true of the Eagles. >>READ MORE: What will the NFL do about Shady McCoy?